LACNIC was an active participant in the Regional Dialogue on Internet Governance that took place in the city of San Jose, Costa Rica, a space for reflecting on Internet Governance for Central America and the Caribbean. This first edition of the Dialogue allowed participants to engage in multistakeholder discussions on various topics relating to the global impact of the Internet, the implications of an interconnected world, Internet access for the most vulnerable populations, and cybersecurity. Oscar Robles, LACNIC’s CEO, participated in the Dialogue together with Fadi Chehade (President and CEO of ICANN), Christopher Painter (U.S. Department of State Coordinator for Cyber Issues), Sally Wentworth (ISOC Vice President of Global Policy Development) and other relevant personalities. Participating in Internet Governance discussion processes under the multistakeholder model, i.e., a model that allows the participation of multiple actors and sectors with an interest in the topics under discussion, is important to LACNIC. During the Dialogue, Oscar Robles stressed that it is “important to determine which Internet Governance issues are truly relevant to the region,” which is why the participation of multiple stakeholders is of the utmost importance. Robles added that it is necessary to understand that “Internet Governance encompasses all the actions we must undertake to the benefit of all peoples.” In this sense, several concerns have been raised in relation to issues such as net neutrality, the right to oblivion, cybersecurity and freedom of expression, among others. Indeed, several of these issues were discussed during the Dialogue, as was the need for tools and coordination among those interested in participating in discussions at regional level. Robles also stressed the importance of generating local and regional debates on Internet Governance issues without competing with the spaces that have already been consolidated, such as LACIGF and the global IGF. 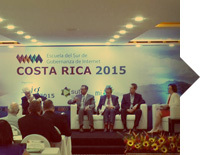 This first edition was organized within the framework of the South School of Internet Governance and represented a great opportunity for anyone interested in furthering discussions on relevant topics and wishing to contribute to regional preparatory initiatives such as LACIGF with a view to the global IGF.